Computer Science and GIS student with a passion for programming, maps and the great outdoors. I decided to make a website, so here it is. Enjoy. I'm a second year Computer Science (B.Comp. Honours, Co-op) student, with a minor in GIS and Environmental Analysis (B.Sc). at the University of Guelph. I currently hold a 90% cumulative average (94% in CS courses). I've just completed an 8-month work term at the Geological Survey of Canada in Ottawa, ON. My project included a database for mapping the geology of Northern Canada and an accompanying web application. I like to always have something on the go. You can check out my current and past projects on my projects page. I'm currently working on learning Rust, and making a new website for Speed River Timing. I've been timing with Speed River Timing since 2009 and had the pleasure of timing prestigious races like the Speed River Inferno, an Olympic qualifying event, as well as the OFSAA, OUA and USport (CIS) Cross Country Championships. I've timing everything from charity to world class level events with up to 4000 participants with events ranging from road, cross country and track running events to with bike, snowboard and speed skating races. I've also been a involved with Scouting for 15 years, both as a participant and leader. I started at the very first opportunity as a first year beaver and carried the program all the way through to where I am now, a Rover Scout and leader with the Scout troop. Through this program I've grown my passion for the outdoors and a desire to share this passion with others. If you ever need a campfire chief, I'm your guy. 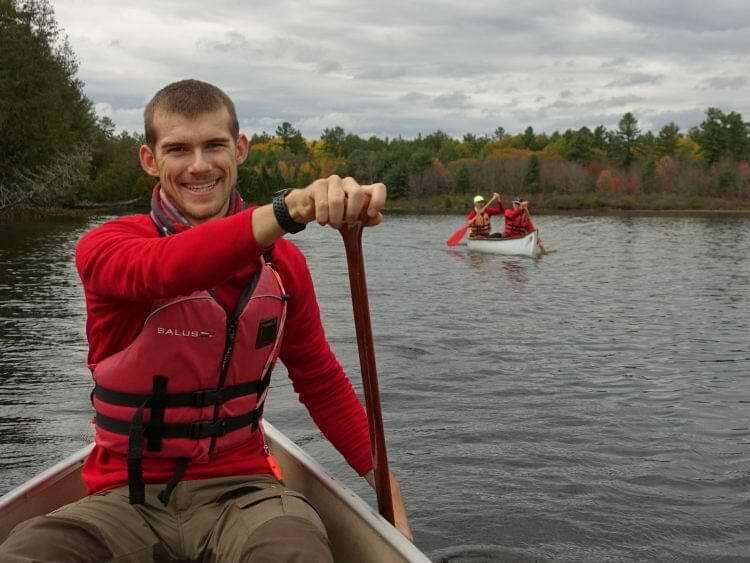 I am currently a president of the Outdoors Club at the University of Guelph, and am a member of the Geography Society and the Society of Computing and Information Science at the University of Guelph. I used to be a pretty mediocre competitive runner, I ran a 17:19 5km one time, and that's about as good as it got I also ran middle and long distance on the track, as well as steeplechase. I went to OFSAA cross country twice, and now run recreationally. I spend as much time as I can living out of my backpack and am always looking for new trails. I've hiked well over a thousand kilometers in the last few years. If you're really into this sort of thing, you can check out my lighterpack here! I don't quite make the cutoff for ultralight, but I'm getting there. My passion for the outdoors doesn't stop on the trails. I try and spend as much time as I can paddling and canoe tripping. I've done many of the popular, and lots of the not so popular routes in Ontario.